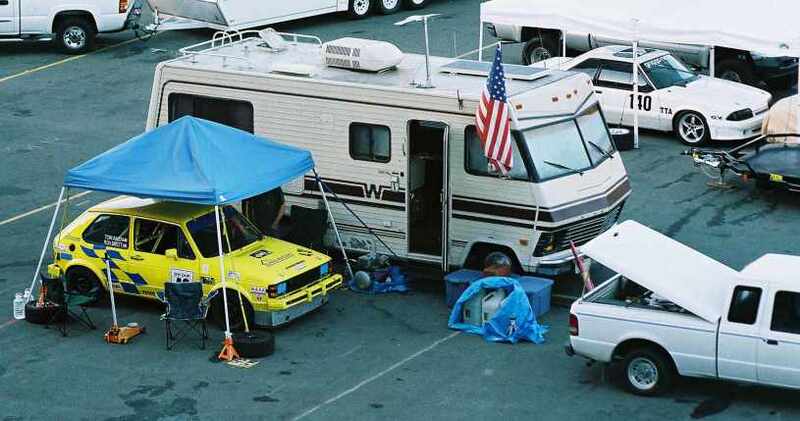 Sears Point Raceway, Sonoma California. 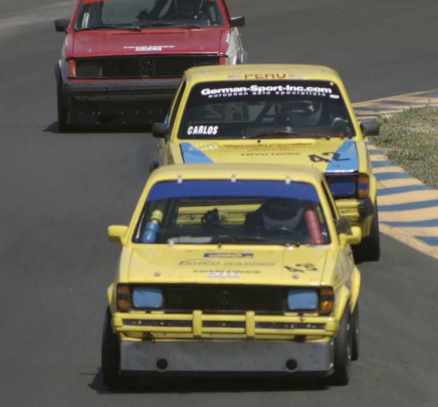 Shed Racing competed in NASA's August 6-7 event at Sears Point International Raceway, in the GTI Cup class. There were 5 cars in class this weekend, with Ron Swett picking up the driving duties Saturday, and Tom Aiken driving Sunday. Other competitors included Scott Neville, Don Bailey, Carlos Suarez, and Dan Piña. 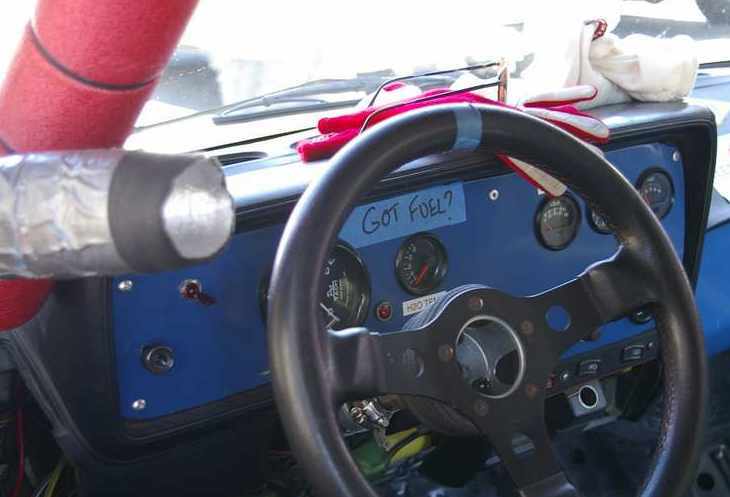 The success of the inexpensive coilover suspension testing at Thunderhill in June resulted in the entire field using the improved spring setups. Bryan and Geoff from Miller Motorsports showed up Saturday to help out (and mooch rides, snacks and bottled water), and Geoff took a few hundred pictures. Marcus and Scott Miller helped out Sunday. Tom hooks the window net in place. Ron started the early morning practice session and immediately had a horrible understeer problem with the car. It just did not want to turn. He wasn't sure if it was simply a problem with cold tires on a cold track, or if it had something to do with the suspension work done since the last race. Ron stuck it out for 2 laps, hoping for some improvement, and decided to drive down pit road to not hold up some faster cars that were behind him. About half way down pit road, the engine died and would not restart. Ron returns to the paddock after a brief practice session. Ron got a lift back to the paddock from the crash crew, where it was determined that the fuel pump had failed. Luckily, Carlos Suarez had an extra junkyard pump, which Tom installed and the car started right up. It was also discovered that during the suspension work, the toe alignment was way off, with almost a full inch toe-in. This is great for straight line stability, but not ideal for a road race car. Best time for the morning practice session was Carlos, with a 2:04.5. Ron double checks Tom's fuel pump install. With #43 running again, and a rough adjustment done to the toe, it was time to qualify. The qualifying session went well, with Ron getting the feel for a much better handling race car. His best lap was a 2:08.4, with Don Baily setting the pole position time of 2:04.1. 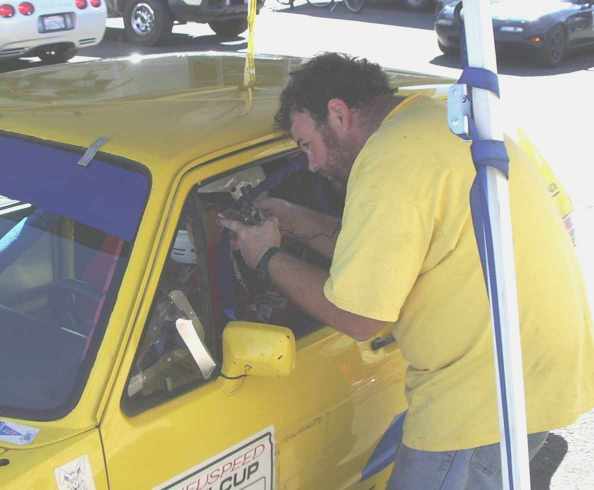 A quick final adjustment to the toe, and it was time to race. Lined up in pre-grid for the Saturday race (image © Geoff Crall). Flying start for the Saturday race (image © Geoff Crall). 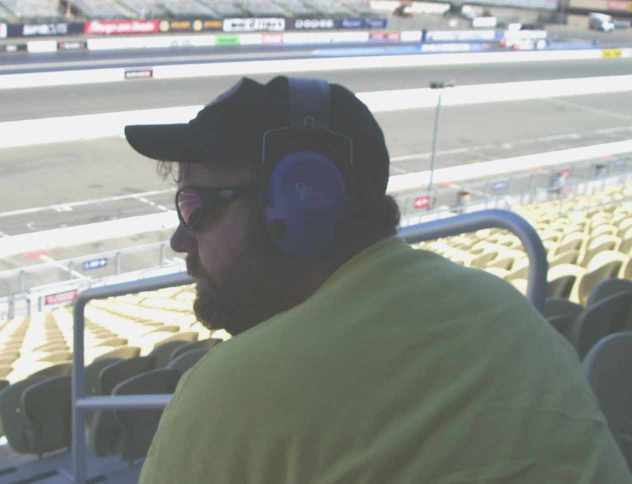 Tom serves as spotter for the Saturday race. Ron got a decent start for the sprint race, and was able to keep the GTI pack in sight until he got held up behind a slower Pro Sedan MR-2, and someone's front bumper that decided to block part of turn 3A for most of the race. Dan Piña retired with an electrical problem, putting Ron in fourth place. Carlos Suarez finished first, followed by Don Bailey, and Scott Neville. Ron finished fourth, with a best lap of 2:06.1, for an average speed of 71.89 MPH. Best lap of the race was Don Bailey with a 2:03.74. Sunday morning, Tom took the early warmup session easy, getting a feel for the new suspension and reacquainting himself with the track. Everything was fine until a strange handling problem appeared near the end of the session. This was later tracked to a loose bolt (well, missing bolt) connecting the passenger side hub assembly to the lower ball joint. Tom's best lap was a 2:11.8. Fastest lap in the morning practice was Scott Neville, with a 2:04.75. The Sunday qualifying session was changed to a qualifying race, with the starting positions based on the inverted finishing positions from the Saturday race. This put Dan on the pole, and Tom on the right side of the front row. Dan held the lead into the first turn, with Carlos passing Tom for second place going up the hill into Turn 2. Dan held the lead until going into turn 3A, when his recurring electrical problem came back, putting him out of the race, and Tom back into second place. 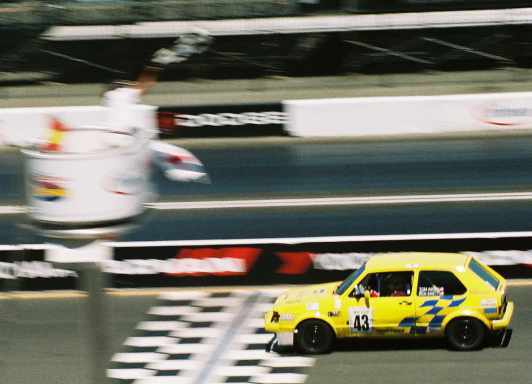 Tom clung to second place for all of 100 yards, before Don Bailey got around him coming out of turn 4, followed by Scott Neville going into the Carousel. At the end of the race, Carlos mistakenly came in one lap early when he saw the starter preparing the checkered flag for another class, putting him a lap down. Scott finished the qualifying race first, followed by Don and Tom. Fast lap of the race went to Don Bailey, with a 2.04.00. Tom's best lap was a lackluster 2:11.04. This won't last long (image © Geoff Crall). The Sunday Race grid was again set by finishing position in the qualifying race, which put Tom on the left side of row 2. The flag dropped, and Tom got a fair start, getting passed by Carlos and Dan in turn 2. Tom stayed with the pack of GTIs for the first 2 full laps, falling back about 3 seconds behind the group. 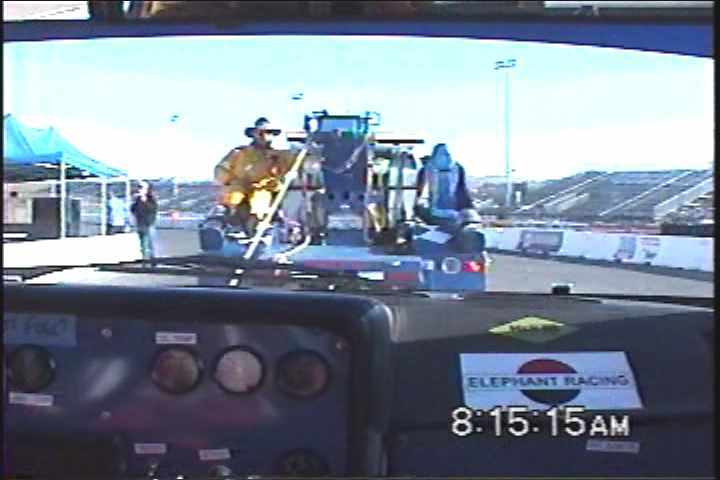 On the third lap there was a disabled car on the outside of turn 6, with a standing yellow displayed at the flag station entering the carousel, and a waving yellow just before the disabled car and crash crew truck. Tom was a little overcautious, and slowed more than necessary for the first pass of the scene, allowing the rest of the GTI field to expand the lead by 4-5 seconds. The following lap, trying to gain back some of the ground he lost, Tom went into turn 4 too hot, and braked too late, going off the track to the outside of the corner, followed by a short run through the grass to get back on track. By the end of lap 4, the leaders in the Baby Grand and Thunder Roadster classes (who started a half lap ahead of the GTI class) started lapping the field, and Tom spent most of the remainder of the race trying not to get in the way of cars turning 15-20 seconds faster lap times. 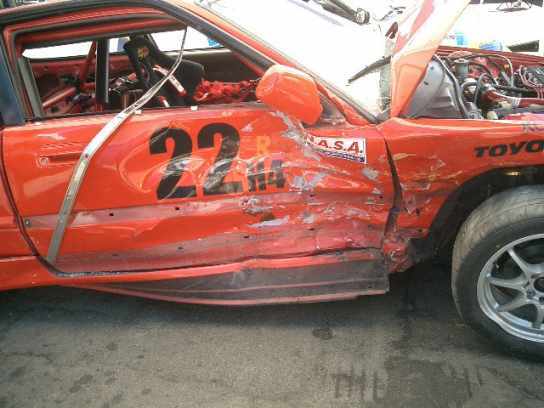 The only other event worth noting was a RX-7 who lost his rear window, leaving a field of shattered safety glass in the track between turns 8A and 9, just off the racing line. In lap 8 while running strong in second place, Dan's electrical problem came back yet again, putting him out of the race again. Carlos Suarez finished first, followed by Scott Neville and Don Bailey. Tom finished 4th, with a best lap time down to 2:06.99 Fastest lap of the race was Don Bailey, with a 2:04.24. Another good weekend. 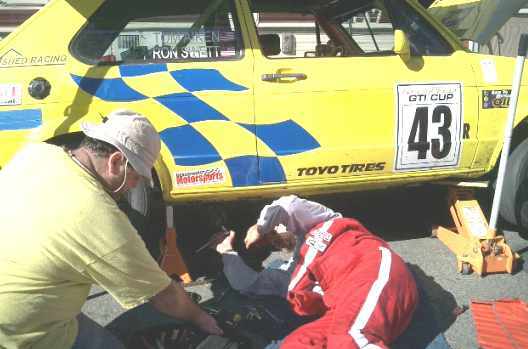 In our first race weekend and second ever trip to Sears Point, we were not front runners, but we were reasonably competitive. Tom and Ron both improved their lap times from their previous visit by about 10 seconds per lap. The car had some problems, but nothing terminal, Thanks to the generosity of our competitors. Tom's welding job on the front tow hook seems to have been adequate.